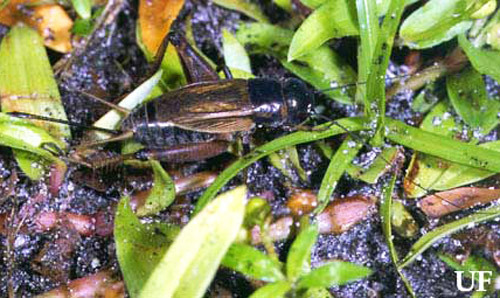 The southeastern field cricket, Gryllus rubens, is the most commonly encountered field cricket in Florida. It is common in lawns, roadsides, and pastures. In most parts of the state, it is the only field cricket that trills rather than chirps. The southeastern field cricket occurs throughout southeastern United States. Figure 1. U.S. Distribution of the southeastern field cricket, Gryllus rubens (Scudder). 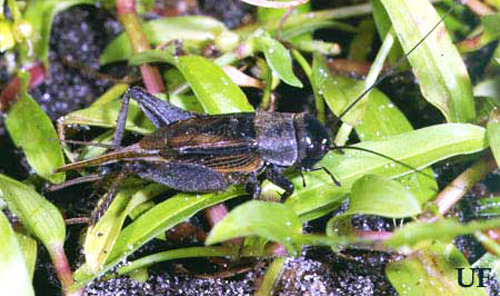 The southeastern field cricket and the sand field cricket often occur together and are sometimes difficult to distinguish except by song (song comparisons). The easiest morphological means of telling the two apart is the color pattern on the forewings. For males, the number and spacing of the teeth in the stridulatory file is definitive. In southern Florida, where southeastern and Jamaican field crickets co-occur, the color pattern of the head will separate the two. In western Florida, where both southeastern and Texas field crickets occur, the only sure means of telling the two apart is by the pulse rate (= wingstroke rate) during the male's calling song. The southeastern field cricket has the slower song, with a pulse rate of less than 62 at 77°F. If the two are singing at the same time and place, a trained ear can identify the males that are trilling at the slower pulse rate as southeastern field crickets. Figure 2. Long-winged, adult male southeastern field cricket, Gryllus rubens (Scudder). Photograph by Paul M. Choate, University of Florida. Figure 3. Short-winged, adult female southeastern field cricket, Gryllus rubens (Scudder). Photograph by Paul M. Choate, University of Florida. Adults are most abundant in spring and fall, but adults and middle-sized to large juveniles can be found throughout the year. Small nymphs do not survive the winters in north Florida, and eggs laid in early December may remain dormant until the following spring. In states to the north of Florida, middle-sized to large juveniles are the overwintering stages and there are two discrete generations with adults occurring in spring and again in late summer. This species occurs in lawns, pastures, and roadsides and is sometimes attracted to lights in numbers. The calling song (657 Kb wav file) of the southeastern field cricket is a trill that is interrupted every second or so (graphs). Often the pulse sequence within the trill not quite uniform, because the wings occasionally pause momentarily during the silent opening stroke. Walker TJ. 1987. Wing dimorphism in Gryllus rubens (Orthoptera: Gryllidae). Annals of the Entomological Society of America 80: 547-560. Walker TJ. 1993. Phonotaxis in female Ormia ochracea (Diptera: Tachinidae), a parasitoid of field crickets. Journal of Insect Behavior 6: 389-410. Walker TJ. 1998. Trilling field crickets in a zone of overlap (Orthoptera: Gryllidae: Gryllus). Annals of the Entomological Society of America 91: 175-184. Walker TJ. (2014). Southeastern field cricket, Gryllus rubens Scudder 1902. Singing Insects of North America. (7 May 2014). Zera AJ, Rankin MA. 1989. Wing dimorphism in Gryllus rubens: Genetic basis of morph determination and fertility differences between morphs. Oecologia 80: 249-255.